We are a family run business farming our own land and we would like to share our beautiful location with those that have a healthy respect for nature and the outdoor life. The site and landscape is set in the beautiful Kentish Countryside overlooking the Weald of Kent only 10 minutes from the centre of Maidstone on a working fruit farm. Natural uneven grass-land or muddied paths connect you to the site and around the site. Wellies are always recommended as back-up footwear. Apple trees in abundance around you and free apples during harvest time! Our vision - to share our unique location with people who have respect for the countryside and a relaxed and independent approach to holiday making. To offer Businesses a place to re-charge their batteries and enjoy workshops / meetings in the countryside away from the stress of the office. 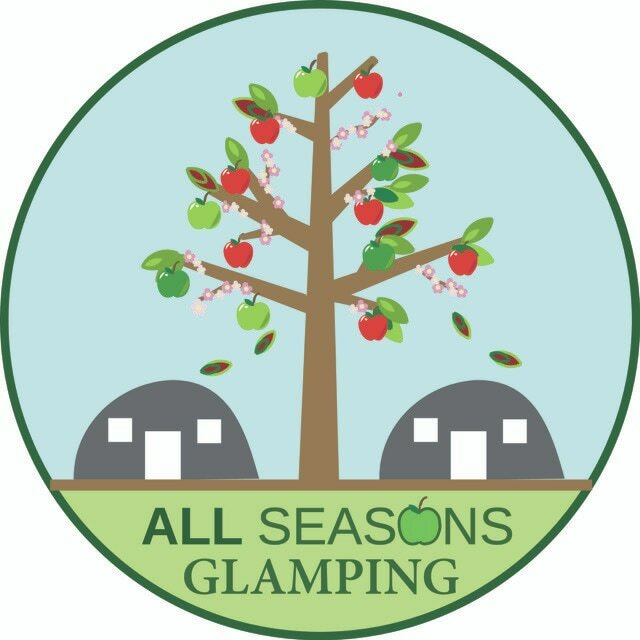 All Glamping accommodation is set outdoors in separate accommodation to the house amongst nine acres of some of most beautiful apple orchards in Kent. Accommodation can be provided for a maximum of 26 people per visit there is also an option for Day event Packages utilising the site for a Business workshop or team building incentive day. 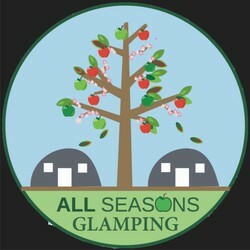 All Seasons Glamping reflect the bespoke and personal nature of our business and its unique location separates us from the rest! Our All Inclusive Package includes many hidden extras including BBQ, fire-pit and use of a full-size fridge, small freezer and microwave and cool boxes for each unit. For booking the entire site we offer exclusivity for your very own private party. The indoor Swimming pool and hot showers are available for your use , with electricity and hair dryer built-in – just bring your costumes and towels! The Games Room is in the main house, and has free Wi-fi for your use. Enjoy the personal packages of afternoon tea here if you want to pamper yourself. It is both spacious and relaxing with an outdoor terrace for cream teas in the afternoon. It is a place where you can watch TV , play ping-pong or catch up on your emails. The SNUG Lounge next to the outdoor kitchen area offers warmth and comfort whatever the weather! The area is enclosed and has a log burner providing excellent relaxation facilities with comfy seating areas including soft sofas, certainly an added plus for your comfort after a nice day walking and exploring the Kent countryside. Drink from the homemade bar and overlook the fire-pit across the unparalleled scenery! Stay connected to the kitchen but you don't have to be in it! Ask about extra touches to personalise your holiday including breakfast hampers, Birthday celebration cakes, Champagne Receptions or Quintessentially English afternoon tea and cake ...... make up your personal package. As well as our fabulous Glamping site in Kent we have an apartment in Menorca. Groups of up to 30 people for a Day Event. Our location is unrivalled as we sit comfortably overlooking the Weald Of Kent. ​Come rain or shine the scenery is fantastic in All Seasons ! Sign up for our newsletter with the latest on what is happening in the local area and use it to guide you. ​It might influence your decision to book around a certain event. Pick your own apples off the tree!